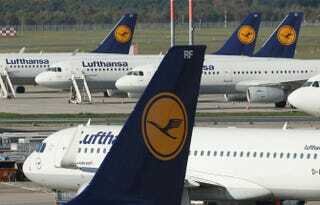 A black traveler claims he was seated next to drunken white supremacists who made violently racist comments and that the cabin crew of the Lufthansa flight he was on did not take his concerns for his safety seriously, The Mirror reports. Chicago resident David Barthwell was on a flight from Ibiza, Spain, to Frankfurt, Germany, when he realized he had been seated next to two "white supremacist Hells Angels." "The one to my immediate right was intoxicated," Barthwell wrote in a Facebook post, calling out the company for not taking his fears seriously. "There was another Hell's [sic] Angel in the window seat, and at least three more throughout the plane." Much to Barthwell's alarm, the men, he said, started a racist conversation between themselves. "As the crew began to prepare for departure, the two men seated next to me began to discuss their plans to unite the white race in order to initiate a global race war," he wrote, according to The Mirror. "They also began to discuss plans to target blacks and other minorities with violence and death." "I began to fear for my safety upon overhearing this, and felt as if they were directing their language at me," he added. However, Barthwell wrote, when he attempted to ask to be moved, he was greeted with the assumption that he merely wanted a better seat. "I detailed to him that my seatmates were white supremacists, were causing me to fear for my safety, and asked if he could please direct me to another seat in a quiet manner," Barthwell said of the male service manager he approached as soon as he was able to get up and move around. "His immediate response was one of incredulity, and replied that he was unable to promote me into a higher class of seating." "At NO point did I request to be placed in the First Class cabin—I only asked to be moved to another seat on the plane at a safe distance, and done quietly," Bartwell emphasized. He was eventually offered another seat, but it was only to the next row in front of the supremacists. When he asked to be moved to an empty aisle in the back of the plane, he was, he says, dismissed because another passenger had her coat on the seat. Barthwell eventually got the flight attendant to ask the woman to move her jacket and he was finally comfortably reseated. "That your crew would not immediately attempt to assist me with concern and instead would prioritize the undisturbed comfort of another passenger's jacket over my comfort and safety as a black man was both incredibly embarrassing and absolutely not the sort of treatment I would have expected on your airline," Barthwell said in his Facebook post blasting the carrier, adding that he would never fly with Lufthansa again. A Lufthansa representative said, in response to the post, "The safety and well-being of our passengers is of our utmost importance and we do not advocate or tolerate discrimination of any kind."